Sawdust might be super excited and frisky, or not want me on his back after his months of romping in the pasture. 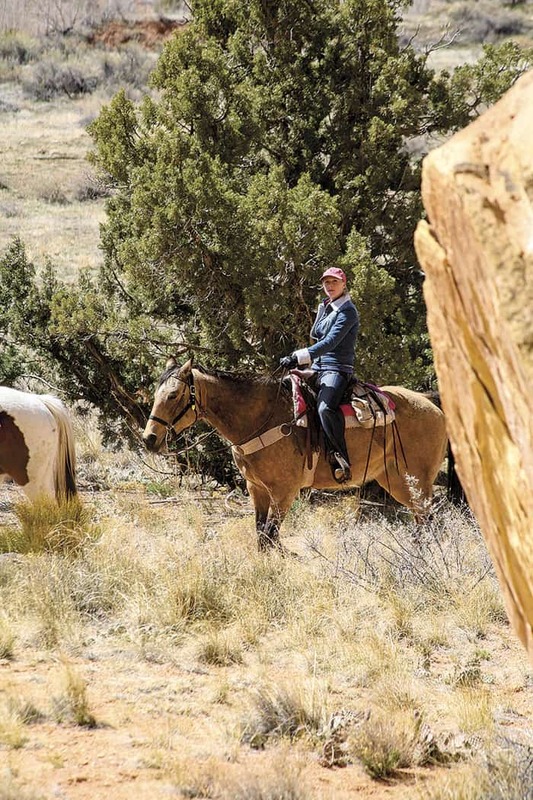 Encouraged by my ride into Capitol Reef National Park, taking Highway 12, a scenic Utah byway that meanders through varied altitudes, pine forests, and miles of lightly pastel colored canyons, I opted for optimism. Fortunately, Sawdust listened to me as we took off on a trail through the sagebrush into a box canyon. I was riding with Pat Kearney of Hondoo Rivers and Trails, who’s been exploring this area for more than 30 years. 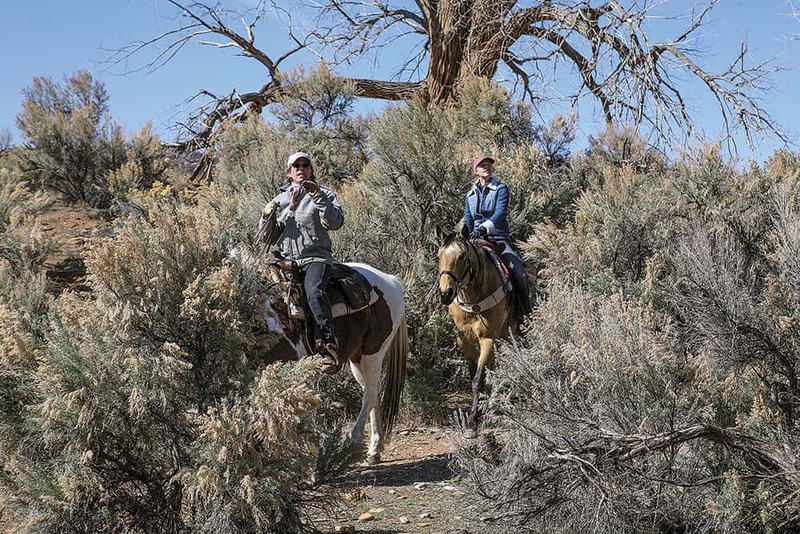 You can bring your own horse to ride here, but the advantage of riding with Pat is that she not only knows the terrain, she has researched the history of the park, even reading pioneer journals to satisfy her own curiosities. This makes her a great guide. Capitol Reef National Park is called the “Land of the Sleeping Rainbow.” American Indians, outlaws and Mormon pioneers all left their marks here. The park’s dome-shaped cliffs and canyons sort of look like the U.S. Capitol. The tall sandstone cliffs are a barrier to travel for those of us on land, just as a reef is a barrier to travel for sailors. 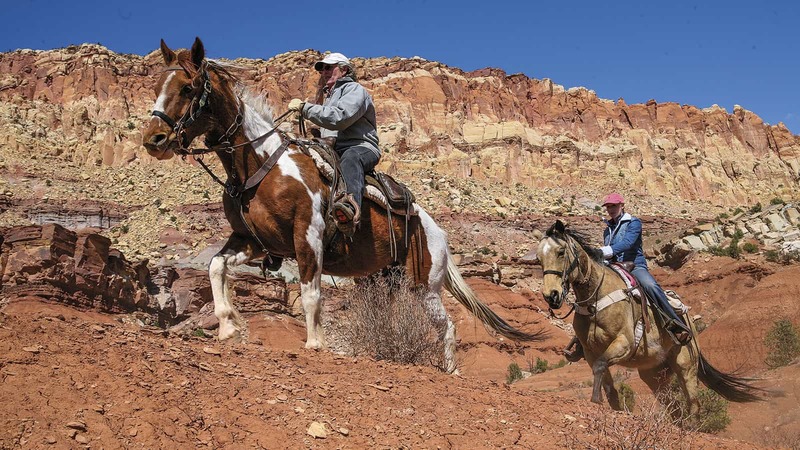 Thus, the park is named “Capitol Reef.” You certainly can’t cross these massive canyons on horseback, which, these days, requires rock climbing equipment to get over them. Looking around at the cliffs and rocks, I could imagine that settling this remote area would have been difficult for the Mormon pioneers, who arrived here in the late 1800s, and for those who lived here before. We rode alongside an old rip gut fence between two canyons that Mormon settlers may have constructed to keep in cattle. The jagged sticks meshed together looked treacherous to cross over, but the fence reminded me of how creative settlers had to be to set up a community here and survive. They had to use every resource available in this isolated, rugged area. One of their greatest resources was the fertile Fruita River, which runs near one-room schoolhouse ran by the Mormon community of Fruita. The schoolhouse has been restored, and visitors to the park can peer through its thin paned windows to see small wooden desks. Remnants of past settlements, like this one-room schoolhouse, help visitors visualize the small, tight-knit community who lived here. My favorite part of the trail was riding in the Capitol Gorge area. 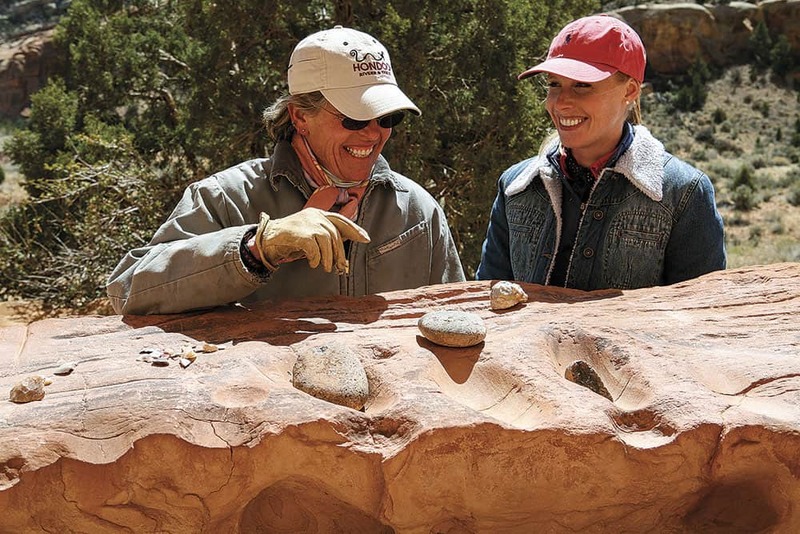 Pat and I dismounted to check out a canyon wall decorated with a wide variety of rock art. The petroglyphs and pictographs that adorn this tall wall are from the ancient Fremont people, an Ancestral Puebloan people who lived throughout Utah and other Western states from around the eighth to the 14th centuries. Pat and I looked at the various images—sheep, squiggly lines that could have been snakes or even an area map, and bear claws—on the wall and tried to figure out what messages this ancient art gallery has left for us. On an adjacent wall, Pat and I discovered more modern carvings. Pioneer settlers had left their mark by carving their names into the stone. Perhaps the pioneers were taking their cue from the Fremont people. Pat, who has read some of their journals, told me about a man who had used a ladder to carve his name high up on the wall above.